Since reading a post on Facebook about a vertical panorama I was determined to try a few. 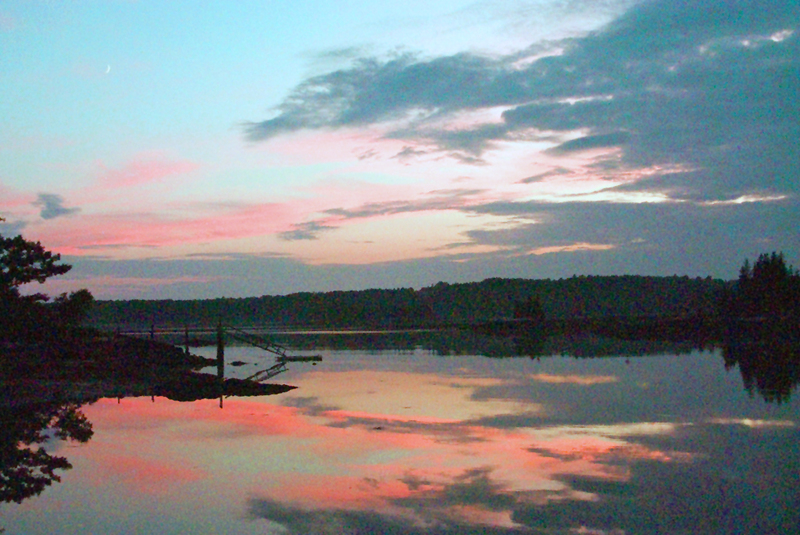 I shot the photos for one while up in Bristol, Maine on the evening of July 11, 2010 and just recently assembled them in Photoshop. The technique works well for cloud photos. 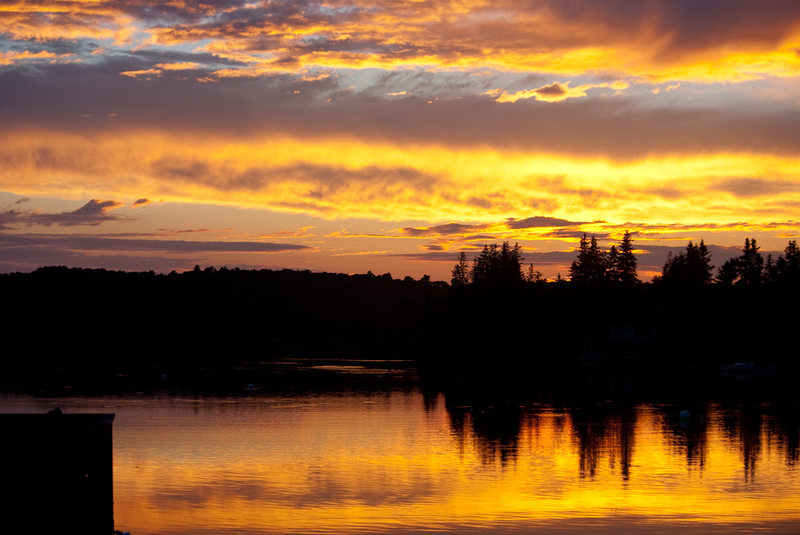 After processing the photos from the Maine trip with Adobe Lightroom I found some sunset photos from the first night that are very nice. I will really miss drinking cocktails, grilling on the deck and eating dinner while enjoying sunsets like this. 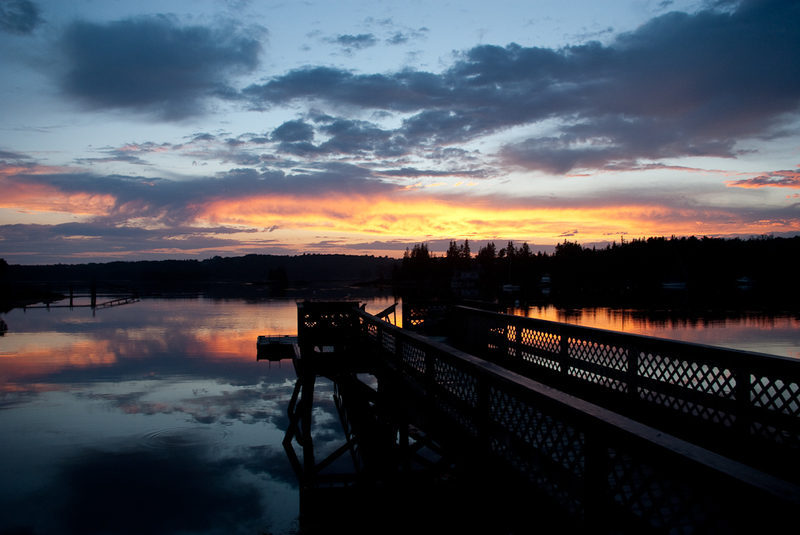 Once again I pulled out the 18 – 55 mm lens for some wide angle shots. I had the photo opportunity I had been waiting for all week for. Sunday morning we went on our last kayak trip of the week. The tide was going out and the sun was shining. It was ideal conditions for seals to haul themselves out on the rocks. I had the Pentax k2000 with the 55-200mm lens and video camera with me in the kayak. Eileen and I approached using the “small pine grove” island as cover. As I expected, they were skittish and many of them slipped off into the water. This little guy crawled back up to sun and was watching Eileen as I slowly floated around the end of the island for the photo. I like the composition of this shot since it has a seal, seagull and lobster buoy. 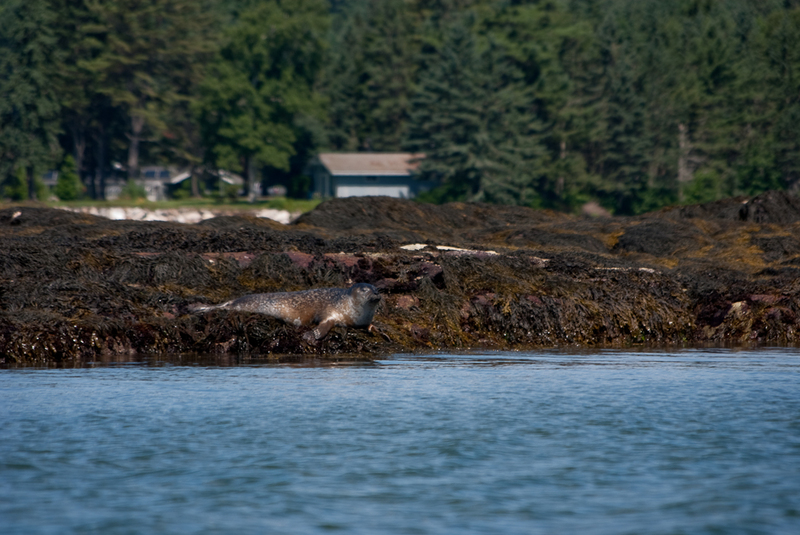 This is another good shot where I got pretty close to a seal without him getting skittish. Its a nice profile of the seal with a house across the bay in the background. Friday morning was overcast and cool and the tide was low when we awoke. 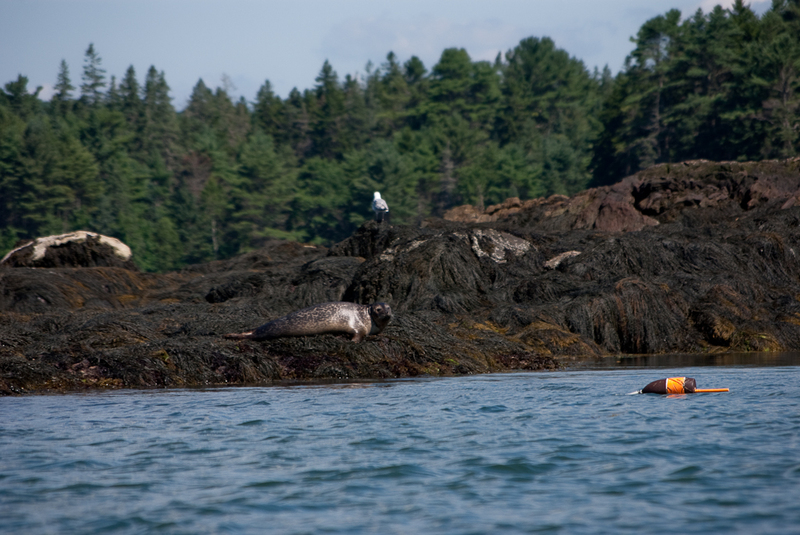 I felt compelled to kayak out to the head of Johns Bay and see if any seals were hauled-out on the rocks. 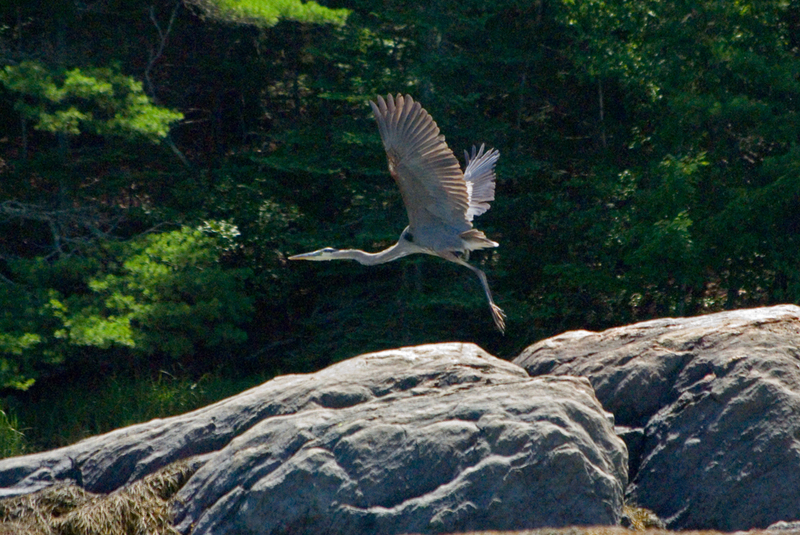 No luck with the seals but we had the pleasant surprise to get another nice heron “in flight” shot and geese photos. 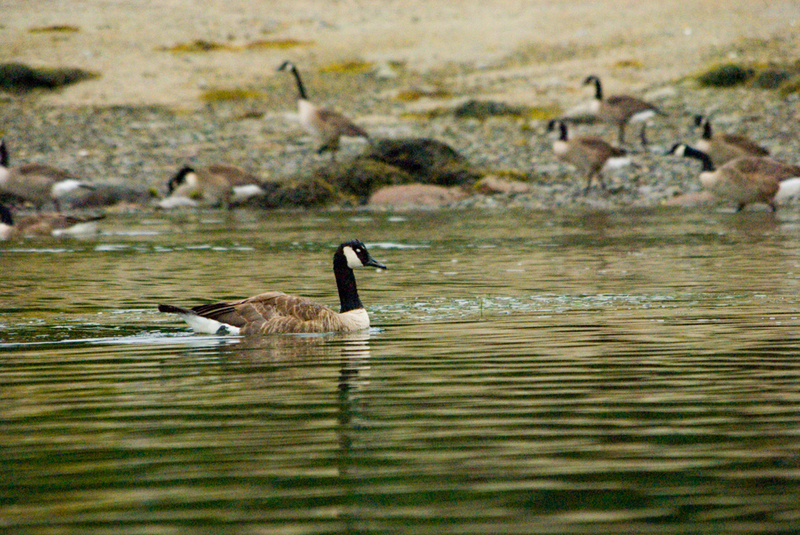 As we approached the dock a family of geese were feeding near the shore. One of them swam surprisingly close to me. Thursday was a beautiful sunny day with temperatures in the low 80’s. 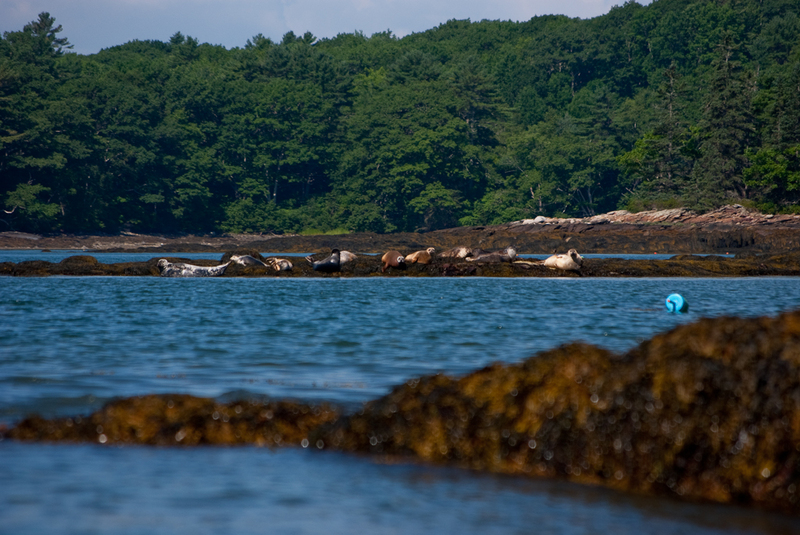 We started the morning with a quick kayak trip across the top of Johns Bay. 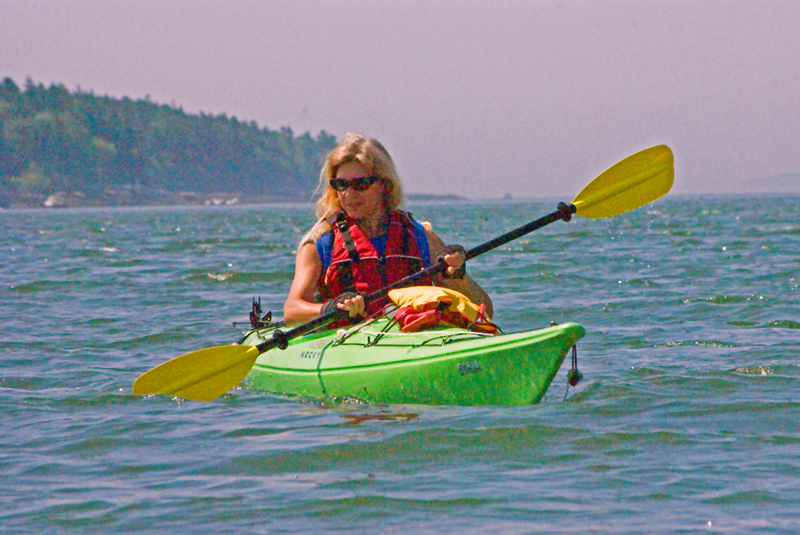 I had the Pentax and got a nice shot of Eileen paddling the Necky Eskia across the bay. I was hoping for some seal photos but the tide was coming in and no seals were hauled-out for shore photos. 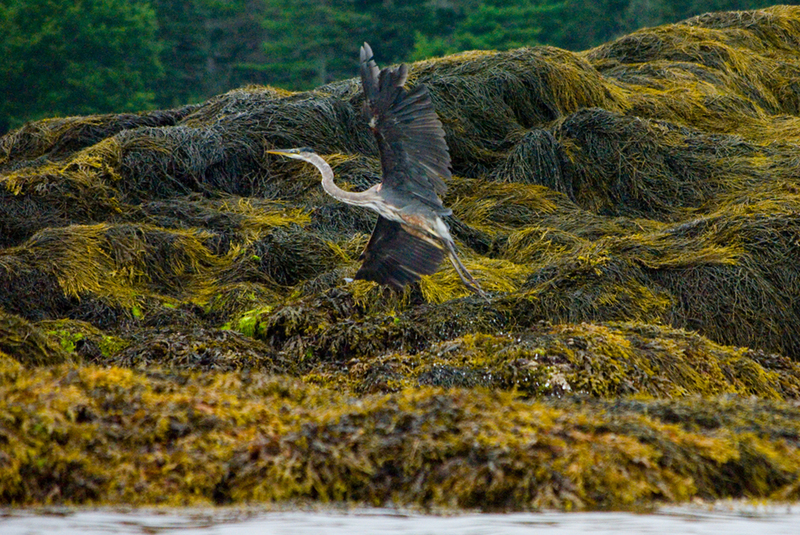 We happened upon a heron at the head of the bay and I got a flight photo that I really like. 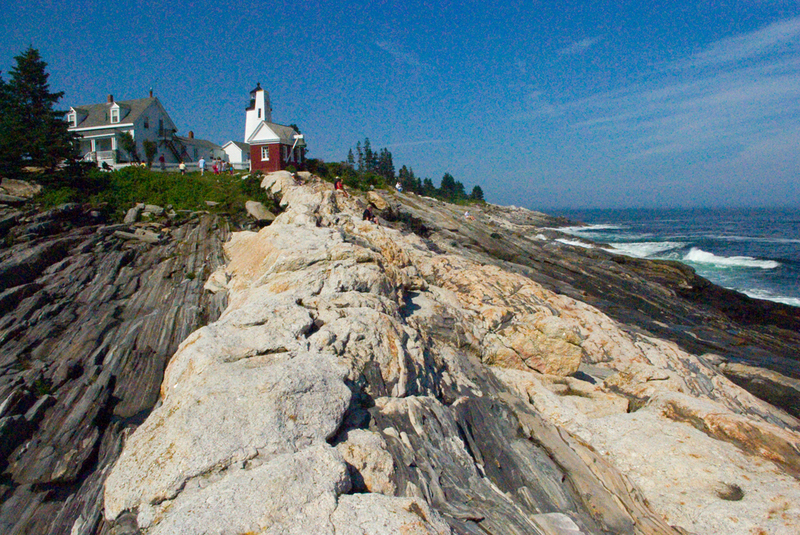 The wind and waves picked up so we drove down to Pemaquid Point Lighthouse for a late lunch and photography on the rocks while watching the waves and surf. Once again I used the 18-55 mm lens to capture as much of the landscape as possible. 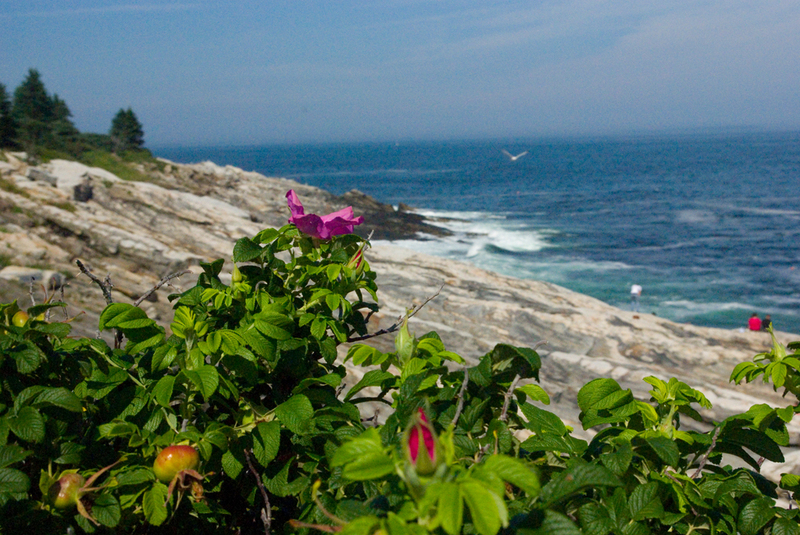 After some shots from the rocks on the point we found a nice spot near the base of the lighthouse to watch the waves. 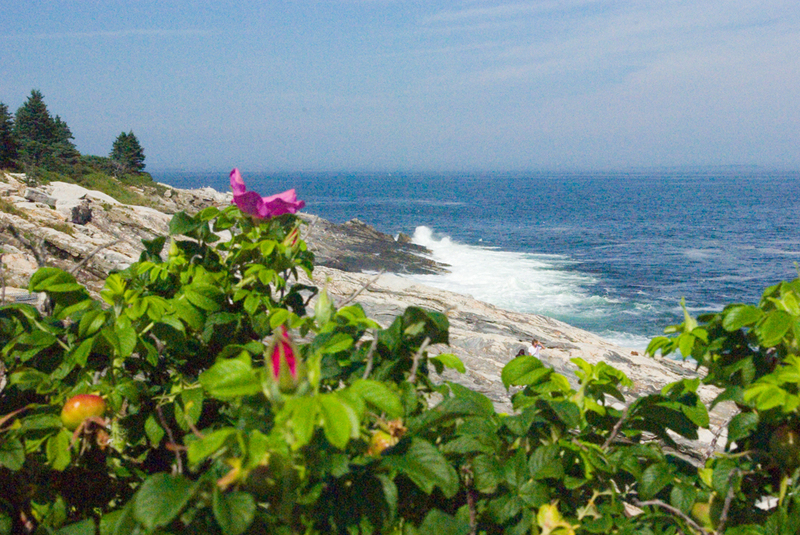 I took a few landscape photos up the coast towards Musgongus Bay with one shot focusing on the flower and one on the landscape beyond. 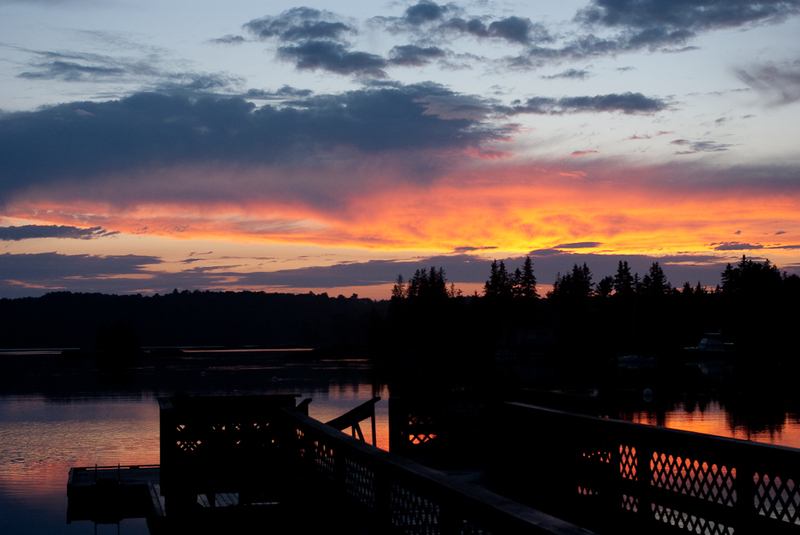 Sunsets from the deck of the vacation home in Bristol, Maine can be fantastic. I have dozens of them collected over the years but I always feel compelled to take more since each one seems to be slightly different. 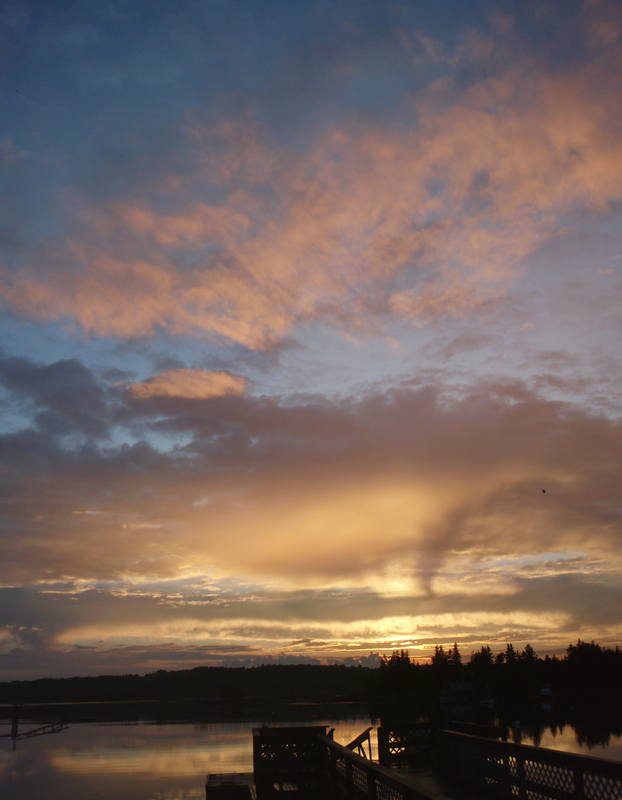 After a rainy start to the day we were treated to a fantastic sunset Wednesday evening. I decided to shoot with the 18 – 55 lens on my Pentax K2000 to try and do justice to the panorama of the scene. The cloud cover gave the scene a blue tone with edges of the cloud highlighted in red. I like the water reflection as well. Wednesday started out to be a rainy but ended up being a fantastic evening with great kayaking conditions. 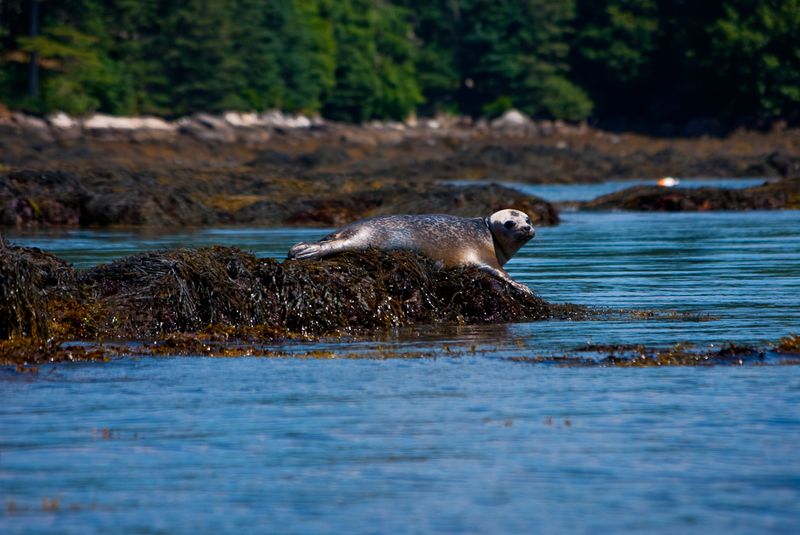 I headed out for a late afternoon trip during low tide to visit the seals. 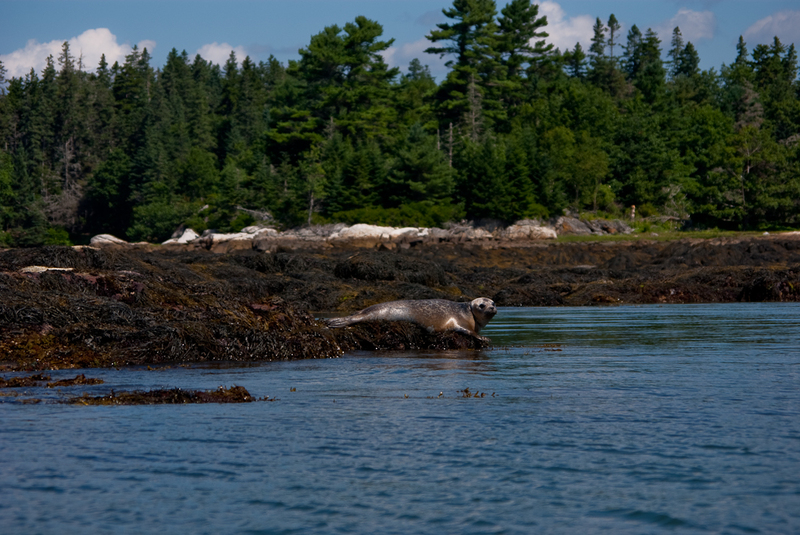 My luck was good and my approach quiet enough so as to not disturb the seals. Check out the YouTube video link below. This is just a short raw video clip. I can’t wait to make a longer edited version using Adobe Premiere Elements when I get home.